Seduced by the spectacle of nature, Gauguin had come so far to see, but driven also by the vision of a painting somehow beyond nature and susceptible to the literary ideas of his time, Gauguin was constantly torn between painting what lay before him, and rendering his mind's image. Ideally, the two should merge into one vision, a poetic form that would marry external nature to inner meaning. In practice, each painting tended more in one direction or the other. This canvas was painted in the Marquesas when Gauguin was living in that "vast atelier, with one small corner to sleep in ... a hammock protected from the sun for a siesta, refreshed by a sea breeze that comes through the cocoanut palms Sfrom the shore a thousand feet off." A passage from this same letter to his friend Daniel de Monfreid will serve as its text: "You know what I think of all those false literary idea's Symbolist or any other in painting... Her in my isolation I have more than enough [nature] in which to steep myself once more. Here poetry wells up by itself, and one has only to permit oneself to fall into revery as one paints in order to suggest it." And in this picture the energetic painter is in a receptive mood. He has allowed a poetry of place, a feeling of this particular spot to penetrate him, so that nature and figures all are one. The frieze arrangement he so often employs is evident again here. The massive seated figure to the left, which he has employed in other compositions, and the bands of colored ground with their irregular patterns are drawn into abstract shapes. Though he wrote "The great error is the Greeks," the figure on the right whose gesture gives the picture its title derives from the Parthenon frieze. 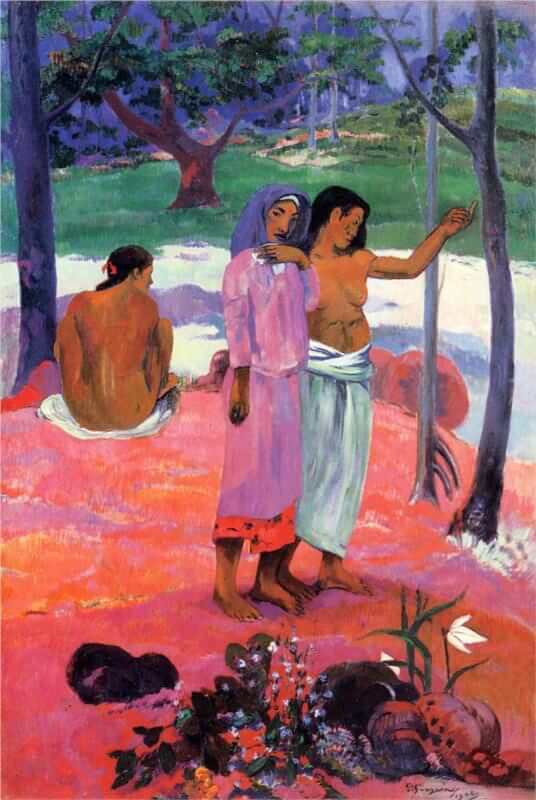 The color harmony, especially the narrow gamut of reds and pinks, lavenders and violets, purples and blues, is Gauguin's own. Yet despite the powerful elements of personal style, this is no imagined landscape. He knew it and loved it well. "I am contented, here in my solitude."